http://m.nzherald.co.nz/aviation/news/article.cfm?c_id=556&objectid=11632028 Singapore Airlines is showing off its latest cabin upgrade in Auckland today as it celebrates 40 years of flying here. The airline has spent $465 million remodelling the cabins of its 777-300s and will use the upgraded planes to cover the peak period in New Zealand. Singapore Airlines celebrated its 40th year of serving New Zealand with a ceremony at Auckland Airport this morning involving long time staff. On May 2 1976, a Boeing 707 landed here after a flight Auckland, via Sydney. The new service - initially just twice weekly - set the stage for the direct twice daily flights to Auckland that Singapore Airlines operates today. The airline also operates between Singapore and Christchurch. Singapore Airlines general manager, New Zealand, Simon Turcotte said the service has made a significant contribution to inbound and outbound tourism. In 1976 just 30,000 New Zealanders visited Singapore, while last year more than 125,000 flew to the city island, an increase of more than 400 per cent. Singapore Airlines has served Auckland using a number of different aircraft, including DC10s, the Boeing 747 series, Airbus 340, several versions of Boeing 777 aircraft, and the Airbus A380. The 777-300 takes over from the A380 which covers the route in the peak season. Singapore Airlines is expanding in New Zealand and will start Wellington services from September 20. The "Capital Express" service will offer four flights per week to Singapore via Canberra, and directly connect New Zealand's and Australia's capital cities for the first time. 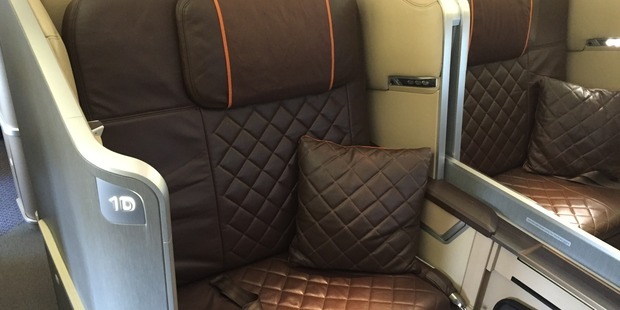 The "Next Generation" cabins aboard the Boeing 777-300ER aircraft feature new comforts and have first class mini-suites that the airline says are among the spacious in the sky and business class seats that have the industry's widest fully flat bed. New economy class seats also have increased personal space and leg-room, the airline said. When Singapore Airlines was formed in 1972, it had just ten aircrafts flying to 22 cities in 18 countries. The airline, which is majority owned by a Singaporean government investment company, now operates a fleet of more than 100 aircraft to 60 destinations in 33 countries.